Right Wing Watch has a post today about the Religious Right's collective amnesia about Dominionism. Following the national attention given to the issue, there have been claims that Dominionism is almost nonexistent among the Religious Right, and simply a paranoid fantasy of liberal journalists. In response, Right Wing Watch had another post titled "If Dominionism Doesn't Exist, Someone Forgot to Tell the Dominionists." Peter Montgomery also had an excellent rebuttal to the denials at Religion Dispatches. Following is a collection of quotes about Dominionism and the "Seven Mountains Mandate" from various apostles and prophets of the New Apostolic Reformation. Chip Berlet and Frederick Clarkson have written extensively about Dominionism and Dominion Theology and point out subtle but significant differences that should be taken into consideration when using the terminology. Berlet has written about the difference between Soft Dominionism or Christian Nationalism and Hard Dominionism, which is theocratic. Because the New Apostolic Reformation is evolving, it is difficult to know where to place its leadership in the spectrum of Dominionist ideologies. There have been significant trends among some of the leadership toward a more aggressive and political application of their Dominionist beliefs in the last few years, and some are more forthright about their intentions than others. Following are quotes on the mandate to take "dominion" from the leaders of the apostolic and prophetic movement, or New Apostolic Reformation, as it has been dubbed by C. Peter Wagner. Some of the quotes indicate how the apostles and prophets envision taking control over the institutions of society and government. Wagner acknowledges that many evangelicals want nothing to do with Dominion Theology. Nevertheless, he is unapologetic about dominion as the goal of the New Apostolic Reformation in his 2008 book titled Dominion!. "The practical theology that best builds foundation under social transformation is dominion theology, sometimes called 'Kingdom now.' Its history can be traced to R.J. Rushdoony and Abraham Kuyper to John Calvin. Some of the notable attempts to apply it in our day have been made by Bob Weiner, Rice Broocks, Dennis Peacocke, and others. Unfortunately the term dominion theology has had to navigate some tough waters in the recent past. A number of my friends, in fact, attempted to dissuade me from using dominion in the title of this book, fearing that some might reject the whole book just because of the title. ...We have now shed our inhibitions over theologizing about taking dominion. Dominion theology is not a flashback to Constantinian triumphalism, but it is a new call to action for a triumphant Church. ...Satan has polluted the land and cursed it. Satan has deployed high-ranking demonic powers to darken the spiritual atmosphere over society and to block the freedom of heaven flowing to earth. Both of these arenas need to be and can be cleansed spiritually. We have the tools to do it, we have the gifted personnel to do it and we have the power of the Holy Spirit to do it. It will be done!" Note that Bob Weiner and Dennis Peacocke have been apostles in the International Coalition of Apostles (ICA). The list is no longer public (and Wagner has passed the role of Convening Apostle to John P. Kelly in Fort Worth, Texas), but Dennis Peacocke still serves on the ICA's Apostolic Council. 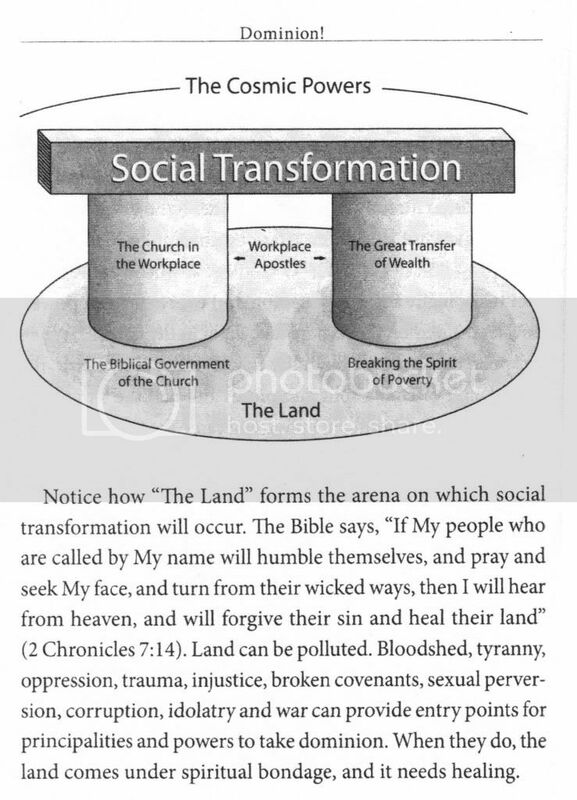 In the graphic at right, Wagner illustrates the significance of taking the land from demons as part of "transformation" and also the anticipated "transfer of wealth" that he teaches will shift money from the ungodly to the godly. "Now that we have social transformation on our evangelical agendas, it is time for action. I regard 'social transformation' as the concept term. However, the action term that will best set us on the road toward that goal is 'taking dominion.'" The apostles and prophets have a campaign that promotes dominionism through what is called the "Seven Mountains Mandate." This is about taking control over the "mountains" of: art and entertainment; business; education; family; government; media; and religion. The terms "spheres" or "gates" were used initially and then changed to mountains. Wagner has written that each of these seven areas should be seen as an "apostolic sphere." The apostles that are to lead the six mountains (other than religion) are called "workplace" or "marketplace" apostles. "The Lord will have dominion over the kingdoms of this world - over government, business, education, arts and entertainment, media, religion, and families." In the book, Patterson describes the Democratic Party as controlled by a "demonic structure" and the source of racism in America. The Seven Mountains campaign has been promoted internationally. The linked video shows Cindy Jacobs, one of the prophets of the movement, promoting the Seven Mountains campaign in Indonesia. Apostle Lance Wallnau is recognized as one of the leading speakers promoting the mandate. In this video Wallnau is speaking about the Seven Mountain campaign at Wasilla Assembly of God. 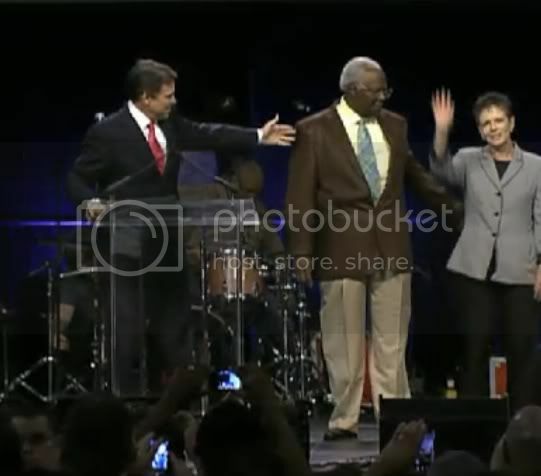 Wallnau begins at about the two minute mark, after he is introduced by Pastor Ed Kalnins. You have authority to deal with all the types of sickness and to displace all the species of demons that have proliferated within the satanic occupation of our seven mountain territories because of what's come through those gates in the past. "Your body on Earth will crush Your enemies." "The last generation will be the 'foot' generation and will rule on Earth over Your enemies. Until they do so, You are not going back to rescue, rapture, save, or anything else. Your body, in fact, will not be a beautiful bride until she has accomplished this crushing of Satan." Toronto-based Apostle Pat Francis echoed this language about ruling on earth, shouting "we put our foot on Hawaii" at a conference in 2009, which included Lt. Gov. Duke Aiona, who ran unsuccessfully for governor, and other candidates in the 2010 elections. ... Then he became mayor of Seoul and when he became mayor of Seoul he dedicated the city to Jesus Christ and he got a lot of criticism by the Buddhists and he said, 'You know, this is my faith and I did what I did and I'm not going to take it back.' When you get to the top you can do some radical things for the Lord and unfortunately many of us are not at the top. And so, Deuteronomy 28:13 says we are to be the head and not the tail. 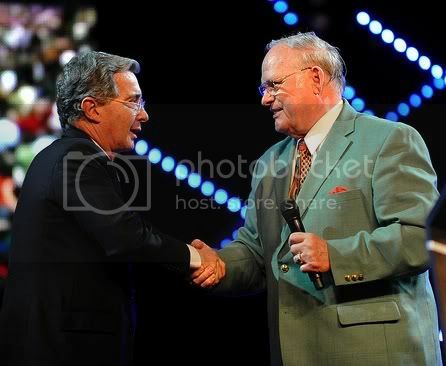 Apostle Bill Hamon is pictured at right with former President Alvaro Uribe at an event led by Apostle Cesar Castellanos. Hamon says he advised Uribe to throw his support behind a "believer" running for mayor of Bogota instead of supporting a candidate aligned with a "socialist, leftist party." Current President Juan Manual Santos also participated in this event. In his 2010 book Prophetic Scriptures Yet To Be Fulfilled, Hamon describes the "Final or Third Reformation of the Church" and its purpose. Hamon refers to an "Army of the Lord Movement" in his writings, including Apostles, Prophets and the Coming Moves of God (1997) with a foreword by C. Peter Wagner. 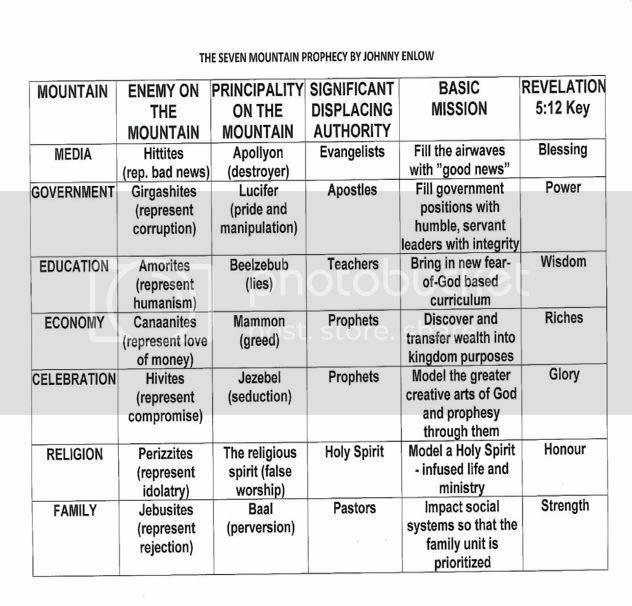 Johnny Enlow, mentioned above, explains more about how this army of the Lord or Elijah Revolution will operate in his book The Seven Mountain Prophecy. "This will change as the Elijah Revolution is released upon the nations. Sons and daughters of the King who understand the call to take the seven mountains will rise to the mountaintops. More important than their confession of faith will be their understanding of Kingdom issues. Do they understand God’s redemptive plan for Israel in these last days? Do they understand that 'if you touch Israel, you touch the apple of His eye'? (Zechariah 2:8). Entire nations will be severely judged or highly blessed and favored based on this issue alone. Governing cannot be done by the flesh anymore, as the issues will be increasingly highly charged spiritual matters that God will directly address—often through devastating judgments (Isaiah 26:9). The world will come to learn, for example, that though God passionately loves every homosexual, remaining in that sin will cause someone to fall under the sword of His judgment. Rick Joyner, a leading prophet in the movement and founder of MorningStar Ministries and The Oak Initiative, describes that at first this kingdom process may seem like totalitarianism. ...The kingdom will start out necessarily authoritative in many ways, or in many areas, but will move toward increasing liberty--so do all true churches and movements that are advancing toward the kingdom. You may have to be very controlling of toddlers, but the older they get, the more they can be trusted, and the more freedom they should have if they are going to develop into true maturity, which requires personal responsibility. The Oak Initiative has several leading apostles on the board and also includes Lt. Gen. (Ret.) William Boykin and Lou Sheldon. Sheldon has claimed that Christian patriots are headed for a holocaust at the hands of a Marxist/Leftist/Homosexual/Islamic coalition. Prior to the 2010 elections, the Oak Initiative produced a video in which Boykin claimed that under Pres. Obama the nation is in the grips of a Marxist insurgency. The video was widely distributed, including by many Tea Party organizations. The Oak Initiative is partnering with Transformation Michigan and Lou Engle in the next The Call event in Detroit on 11/11/11, with the mission of fighting the demon of Islam. "Today's praying Church is rising up in militant force to possess the promised land of our nations." Speaking at Wasilla Assembly of God earlier this year, Jacobs described a plan for mobilizing 500,000 intercessors or "prayer warriors" as they are often called, to impact the 2012 elections. "a ministry of Spiritual Warfare to take/occupy/and establish God’s Kingdom rule in South Carolina and America." New Apostolic websites are already starting to be stripped of references to Dominionism. On August 22, Right Wing Watch listed quotes on from Os Hillman's "Theology of Reclaiming 7 Mountains" that have been removed from the page. I'll be writing more about how the apostles and prophets of the movement believe they will take control over the "Seven Mountains" and impact the 2012 elections. ...who are horrified by the authoritarian, and in some cases totalitarian, tendencies in Dominionism. So your contribution is very welcome here. I just want to say in response to your concern that your perspective will not be welcome here. Quite the opposite. Welcome! I am sure that many readers will find your knowledge and experience very valuable. simply put the letter p enclosed in angle brackets (less than and greater than signs ( shift+, and shift+. ) on your keyboard at the beginning of each paragraph and /p in the same brackets at the end. I'm an ex-evangelical who is scared that these people will somehow get a foothold. I am receiving e-mails from pastors thanking me for my interview on Fresh Air. This issue is not about secularism vs. religion as some would claim. Dominionism is a threat to the broad and diverse spectrum of religious practice that we have in this country. But this notion of absolute control over all levels of society really brings to mind George Orwell's 1984, the idea now is instead of government control over all aspects of life, the churches control the government and "separately" all other aspects of life. To be fair Orwell was writing about the totalitarian nature of the USSR, but it is easy to see the parallels in the dominionist movement. Particularly from MorningStar Ministries, the name of which is quite confusing because the last time I checked the morning star was, depending on your angle, a symbol for the goddess Venus or Lucifer the light bringer, not God or Jesus. And they accuse us Catholics (I am a very lapsed catholic) of being idolaters. But what they said about "The kingdom of God will not be socialism, but a freedom even greater than anyone on earth knows at this time. At first it may seem like totalitarianism, " Quick note for the uninitiated, if at first it seems like totalitarianism it probably is totalitarianism. O'Brian said it best, "one does not establish a dictator to secure a revolution, one establishes a a revolution to secure a dictatorship." Additionally "...The kingdom will start out necessarily authoritative in many ways, or in many areas, but will move toward increasing liberty--so do all true churches and movements that are advancing toward the kingdom. You may have to be very controlling of toddlers, but the older they get, the more they can be trusted, and the more freedom they should have if they are going to develop into true maturity, which requires personal responsibility." This to me is absurd, but what does give me a bit of hope is that the above quote sounds like a mustache twirling villain, so odds are good they won't win many elections with that kind if speech. I have heard other people liken this to The Handmaid's Tale by Margaret Atwood. I haven't read it, but I think I will have to now. I read 1984 in high school and have been told it becomes more meaningful when you read it as an adult, so I may have to read that again, too. One thing those dominionists forget is that lots of people have guns, and will resist to their teeth any takeover. Besides, I am an Eastern Orthodox Christian, and my church has survived the Muslim expansion, Ottoman oppression, and Communism. We are still here, although a minority in the West, and I don't think we are going away. This organized campaign has been in action for at least 30 years. The attention on it now is because it is bearing fruit; it has been successful. Starting at the grassroots levels throughout the country (including school boards and town councils), intertwined to top levels of government in WA D.C., they've already become entrenched and powerful. Why do you think our government has become so ineffective, our civil rights have been rolled back, monopolies exist again, consumer protection has been gutted, our economy is a disaster, our schools are a mess, international corporations own our government officials if they want to stay in office, lobbying groups have been writing our legislation for years, we imprison more of our citizens than does any other nation on the planet and the list goes on and on? The greedy and the self-righteous have been working together for 30 years and wreaked havoc on this nation while the public received and still receives a steady diet of propaganda turning us against each other, against our government, and against our own economic interests. So, anyone who plans to stand up and fight back had better get cracking because it might already be too late to turn things around without our first having to descend into abject misery and poverty that leads to full blown revolution again. The "morning star" image comes from Revelation 22:16 where Jesus is quoted as saying, "I am the root and the descendant of David, the bright morning star." Its use has a long and honorable history, including the beloved Moravian Christmas hymn "Morning Star, O Cheering Sight" with text by Johann Scheffler (1657), tr. by Bennet Harvey, Jr. in 1885. As I've commented before on this site, it is always troubling to me when a perfectly reasonable Christian term or image is co-opted by Dominionists. Whenever I read something like the following--and I've read many similar articles on this website and elsewhere--what leaves me absolutely speechless every time is the breathtaking narcissism of it all. And it always leads me back to a few very obvious questions: Just what do the Dominionists think the rest of us are going to do about their well-publicized plans for taking dominion? Do they really believe we're going to allow them to have it their own way, that we're going to just roll over and play dead for them? Doesn't it ever occur to them that we might...you know, RESIST? Re "The kingdom of God will not be socialism, but a freedom even greater than anyone on earth knows at this time. 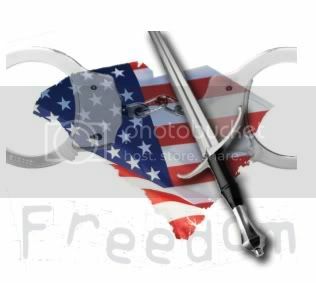 At first it may seem like totalitarianism, as the Lord will destroy the antichrist spirit now dominating the world with "the sword of His mouth" and will shatter many nations like pottery. However, fundamental to His rule is II Corinthians 3:17, "Now the Lord is the Spirit; and where the Spirit of the Lord is, there is liberty." Instead of taking away liberties and becoming more domineering, the kingdom will move from a point of necessary control while people are learning truth, integrity, honor, and how to make decisions, to increasing liberty so that they can." As someone said upthread, if it seems like totalitarianism, it's because it IS totalitarianism. And to paraphrase the rest of it, he's saying that "the kingdom" will be oppressive and tyrannical at first, but as soon as we've all become sufficiently cowed and conditioned, we can then be allowed a few more freedoms, like having our curfews lifted (or something). It doesn't seem to occur to people like Joyner that "the ungodly" not only don't accept but utterly reject his valuation of them. That we don't see ourselves as possessed by "the antichrist spirit." That we believe ourselves to be in full possession of truth, integrity and honor already, and don't need or want him and his ilk to teach us how to make decisions. It's as though he really believes we're already the automatons he'd like to turn us into; that we don't have free will and won't fight to the death against any encroachment of it. When he announces his intentions so blatantly about the "great transfer of wealth" and all the rest of it, and not only doesn't bother to hide them but actually brags about them--does he really think the people on the receiving end his threatened tyranny aren't going to resist? It's as though he thinks we can't read or hear his words because he wasn't addressing us directly, the way some parents talk over the heads of their children. As though we aren't even human and have no free will worth considering. Which come to think of it, is most likely exactly what he DOES believe! In his commentary http://socialsatisfaction.org/archives/127 on his experience that led to the film project, the director of the documentary Silhouette City talks about Christian Patriotism, Dominionism, and the apocalyptic communications infrastructure. Michael Wilson of Social Satisfaction also produced a short video on The Call San Diego in 2008, which we have referenced many times at Talk2action. If you haven't watched it, you should! Greg, they seem particularly entrenched in Korea for some reason. Do you have any insight on that? I'm going to be writing about some things happening in Korea. I am reposting the link to your article here. Evangelicals across the country are going to have to come to grips with how to frame this discussion, as you suggested. As the NAR gains political clout, their ceremonies "divorcing Baal," destroying other religions' artifacts, and claiming that everyone else is controlled by demons, will doubtless draw more attention. We know that this is not typical of American evangelicalism. I think it's going to be increasingly important for evangelical and other religious leaders to publicly and forcefully explain why they do not support the activities of the NAR, particularly since most Americans do not know the difference between evangelicals, fundamentalists, charismatics, and Pentecostals, much less how to identify the NAR.